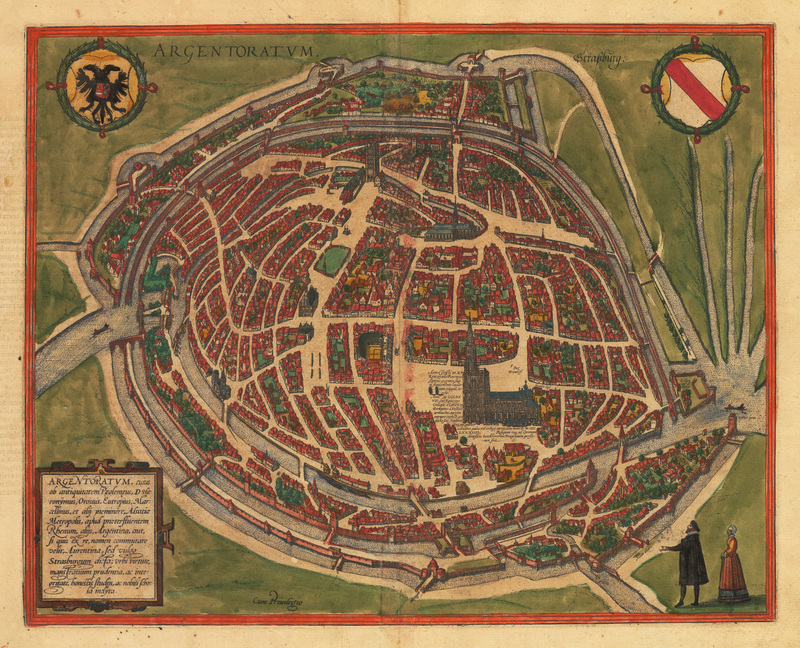 This Braun and Hogenberg map of Strasbourg is from the second edition of their monumental oeuvre, Civitates Orbis Terrarum. Originally a Celtic village, under the Romans Strasbourg became a garrison town known as Argentoratum. This bird’s eye view of the city depicts its marvelous planning and its magnificent fortifications, including both walls and waterways. Streets and boulevards are wide and at the city center rises a great architectural edifice, the Cathedral of our Lady of Strasbourg, whose construction took over three hundred years. Rising 142 meters, the cathedral’s north tower, clearly rendered here, was the tallest building on the continent and perhaps in the world for over two hundred years and to this day is the sixth tallest cathedral in the world. For centuries the city has been a major commercial and cultural center, and in the modern era Strasbourg has become an eminently important city for the European Union and its governance. Cartouche: Strasbourg, mentioned since antiquity by Ptolemy, St Jerome, Orosius, Eutropius, Marcellinus and others, is the capital of the Alsace, on the nearby flowing Rhine, called by others Argentina or Aurentina but Strasbourg by the ordinary people. A city widely famed for the virtue, prudence and integrity of the magistracy, respected scientific studies and a well-known school. Descriptive text in Latin is on the verso. Condition: This map is in B+ condition with light soiling. Reinforcement of the centerfold on the verso.